Alec LaBau, the assistant director of audio at Krannert Center for the Performing Arts, shows the equipment that will pick up an audio signal from the center’s new assisted listening system. A patron can plug a headset into the pack or attach it to a loop receiver to wirelessly transmit an audio signal to a hearing aid. CHAMPAIGN, Ill. — People with hearing loss will find it easier to enjoy a concert, play or dance performance at Krannert Center for the Performing Arts. 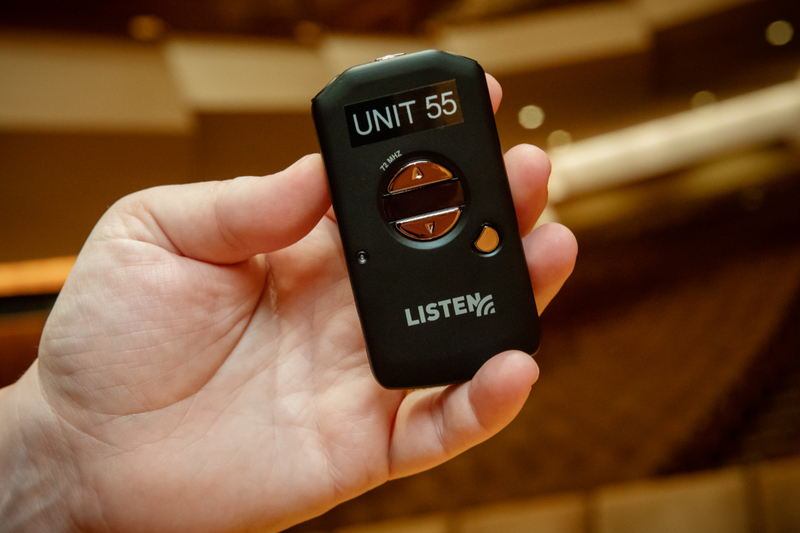 Krannert Center recently installed a new assisted listening system in all its theaters and its lobby, replacing a failing and unreliable system. The new system works on an FM radio signal. Patrons can check out a small, lightweight pack that will pick up the signal from the theater for their event after they select the name of the theater on the pack’s display screen. They can plug a headset into the pack to listen or attach the pack to a loop receiver that wirelessly transmits the signal to a hearing aid. 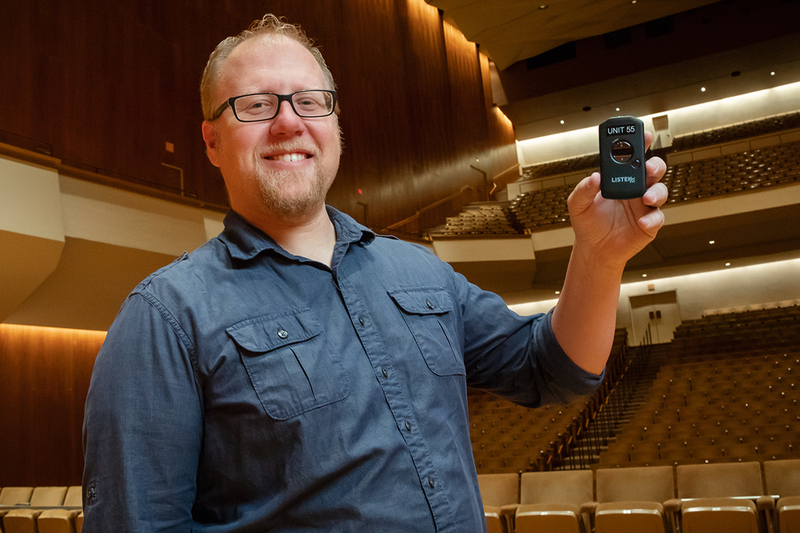 “It’s a really simple and user-friendly system,” said Alec LaBau, Krannert Center’s assistant director of audio. Krannert Center patrons select the name of their theater on the pack to pick up the audio signal for their event. Krannert Center has been planning for the new system for a few years. Installation involved putting a new microphone in the ceiling of each theater to capture the audio of a performance, as well as antennae for transmitting the signal. An electrician ran cable between the microphones, transmitters and antennae. The Tryon Festival Theatre and the Studio Theatre previously had an infrared listening system. A patron’s pack had to be able to pick up an infrared light signal, which could be problematic, LaBau said. “(Patrons) had to wear the pack on the outside of their clothing. It had to be able to pick up the infrared light. If they moved or pointed in the wrong direction, they could lose the signal,” LaBau said. In addition, the infrared system required adjustments every time the configuration of the Studio Theatre changed for a new show. The FM system doesn’t have those drawbacks, and every theater now has the same system using the same hardware, LaBau said. The system also is available in the lobby – for example, during Opening Night or ELLNORA: The Guitar Festival, the system will feed the audio straight from a soundboard to the pack that patrons carry. “We’re excited to provide this enhanced experience for our patrons by providing the most up-to-date technology for those with hearing challenges,” LaBau said. 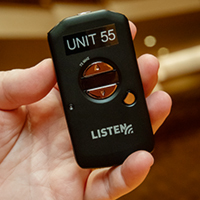 Krannert Center has 60 assisted listening system packs available at the patron services counter and will buy more if there is greater demand, LaBau said. Money from Krannert Center’s general fund will pay for the $30,000 cost of the system, but the center is looking for donor support as well. Editor’s note: For more information, contact Bridget Lee-Calfas at blkee@illinois.edu.